Fourteen doctors have been arrested in the state till this evening under the Rajasthan Essential Services Maintenance Act (RESMA) as the deadlock between them and the government entered its sixth day. (EDs: Corrections in para 2,3) Jaipur, Nov 11 (PTI) Fourteen doctors have been arrested in the state till this evening under the Rajasthan Essential Services Maintenance Act (RESMA) as the deadlock between them and the government entered its sixth day. The arrests came after the deadline set by the government for the medical practitioners to resume work expired yesterday evening, the officer said. Yesterday, six doctors were arrested and today, eight, Reddy said, adding that 100 doctors have joined work to avoid arrest. Meanwhile, Rajasthan Health Minister Kali Charan Saraf called the agitating doctors for talks tomorrow at 2 pm to find solutions to their problems. A five-member delegation representing the doctors will meet the minister and government officials, an official release said. "The state government has assured that doors for talks are open and it was committed to find solutions to the problems," it said, adding that ample arrangements have been made so that health services are not affected. The state's medical and health department also issued a notice today in newspapers to the agitating doctors, claiming that the strike was against the high court's order. The department had asked them to resume work by Friday. One of the major demands of the doctors is for higher pay scale and promotions. Director of Public Health Dr V K Mathur said, "We are trying to reach an amicable solution through talks." The presidents of the All Rajasthan In-Service Doctors Association president, Dr Ajay Chaudhary, and the Jaipur Association of Resident Doctors, Dr Ravi Jhakar, could not be reached for comments. Saraf had yesterday held Chaudhary responsible for the strike. "Dr Chaudhary seems to have some personal interest... he is trying to create hurdles in breaking the deadlock. He is being guided by someone," the minister had alleged. 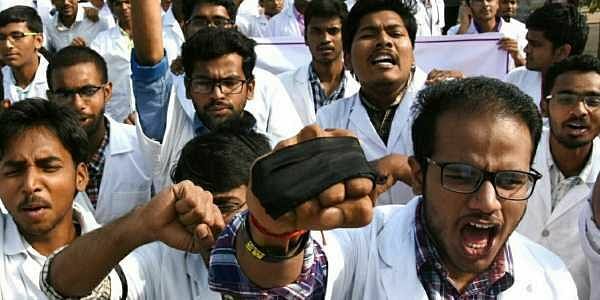 In Kota, 57 senior resident doctors today announced to join the statewide strike by tomorrow morning, a move that could hit services at the Kota Medical College and the Maharao Bheem Singh hospital, the biggest medical facilities of the region. However, medical college authorities have asked the doctors, selected through the Rajasthan Public Service Commission (RPSC), to resume duty or face termination. "It would hugely affect the medical and health services in hospitals in Kota as 57 senior residents, including 35 to 37 from the clinical side are set to join the ongoing strike from tomorrow morning," said Dr Girish Verma, principal, Kota Medical College. "We have asked the RPSC selected doctors, including senior residents, to resume duty immediately or face termination," Verma said. Senior resident doctors of the Jhalawar Medical College, however, have stayed away from joining the ongoing strike, while Dr Hariom Goyal today resumed duty at the government hospital in Baran district. "We have not received any notice or information from senior residents regarding their joining the ongoing strike," said Dr R K Asariya, Dean, Medical College Jhalawar. More than 640 doctors in service and about 350 resident doctors from the Kota region along with the others in the state are on strike for last six days. PTI CORR AG ANB ANB .